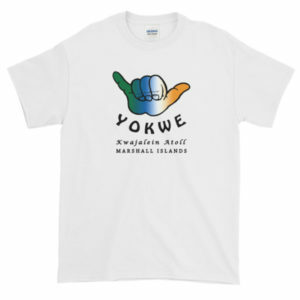 Express your Rimajol with these great Republic of the Marshall Islands short sleeve t-shirts in dark colors. What does the flag mean, you ask? See further below for the details. Express your Rimajol with these great Republic of the Marshall Islands short sleeve t-shirts in dark colors. What does the flag mean, you ask? See below for the details. The rising diagonal band represents the equator, the star above representing this Northern Hemisphere archipelago. The white and orange portions of the band represent, respectively, the Ratak Chain (“sunrise”) and the Ralik Chain (“sunset”), as well as symbolizing peace and courage. 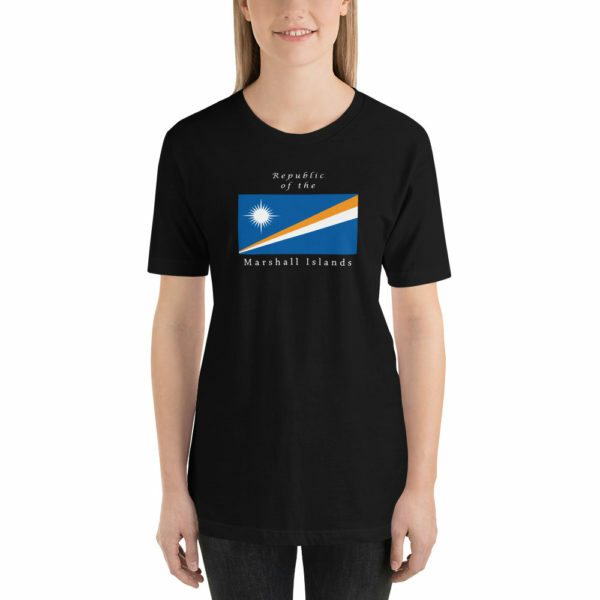 The sun’s 24 points represent the number of electoral districts, while the four elongated points represent the principal cultural centers of Majuro, Jaluit, Wotje and Ebeye.